Cultural Front: Lost Southern Voices: Mapping Edward P. Jones’s D.C.
Lost Southern Voices: Mapping Edward P. Jones’s D.C.
On March 23 and 24, I participated in the Lost Southern Voices Festival hosted by Georgia State Perimeter College in Atlanta, Georgia. The event was organized by my graduate school cohort member and friend, Jennifer Colatosti along with her colleagues Pearl McHaney and Andy Rogers. In my presentation, I chose to highlight an overlooked geographic location rather than a forgotten or “lost” writer. I focused on Edward Jones’s representations of African Americans “up south” in the nation’s capital—Washington, D.C. Despite the long history and dense population of African Americans living in or near the nation’s capital, the predominately black quadrants of Washington D.C., have a relatively small presence in the scholarship on African American literature. Jones, however, utilizes these locations and populates them with African American characters not by happenstance. Instead, he embeds his story with subtle societal traits to make the correlation between race and location more apparent. In my presentation, I previewed a heat map from an upcoming digital publication. In 2017, I taught a graduate course, “Lost in the City,” that covered Jones’s two collections of short fiction. In the class, my students and I collaborated on a dataset that tracked all of the locations and streets mentioned in Jones’s work. One of the students in the course, Ahmed Foggie, used ArcGIS to transform our data into an interactive map. 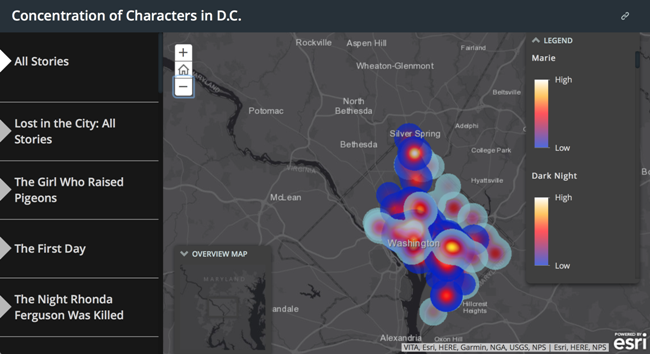 The heat map below highlights the areas in D.C. that Jones refers to most often in his short stories. By clicking on an individual story to the left, you are able to see all of the locations mentioned in that story. The brighter the color indicates that more action took place in that particular location(s). Jones’s constant references to street names, cultural figures, and landmarks draws on historical and social memories of D.C. for each character. These memories reveal how a select geographic location has the ability to conjure a range of emotions and thus become significant to the overall plot of each story. A map like this is particularly useful given the changing landscape of D.C. over the past two decades.